We are hunters for hunters! Fancy bags need not apply...we roll with the generic brown bags and focus our attention on the best mineral out there. Do you want to grow your bucks? That all starts with a healthy herd; healthy does + healthy fawns = bigger, healthier bucks. RAKS is not an overnight growth hormone that will grow your deer in one year - yes you will see increase in body mass and antler mass within the first year but the real results come 3-5 years down the road. Your fawns have been getting the nutrients they need 24/7 365 beginning in the gestation period, carrying through the lactation stage and ultimately nose down in the products themselves! If you are looking for honest, proven results then you need to join the #BrownBagNation and #GrowASet because #sizematters and we want you to #ShowUsYourRAKS on trail camera then ultimately in your harvest photos! RAKS™ Big Game Supplements, with their painstakingly formulated nutrients and minerals, gives landowners and hunters a great shot at big game trophy hunting and huge racks while making the entire herd healthier. RAKS™ offers the finest quality big game supplements to increase overall herd health and produce trophy antlers. 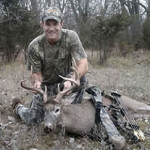 RAKS™ founders set out to provide the ultimate in deer and big game nutrition all while outperforming the competition.